Search for the best flight prices from Manchester to Goa. Compare prices, book today and save money with Manchester Airport. Arrive in Goa and step back in time to a holidaymaking era when psychedelia and free love were all the rage. Alternatively, peel back the veneer, get laid back like the locals and relish a distinctive spot on the subcontinent with much to offer besides beautiful beaches and the Arabian Sea. 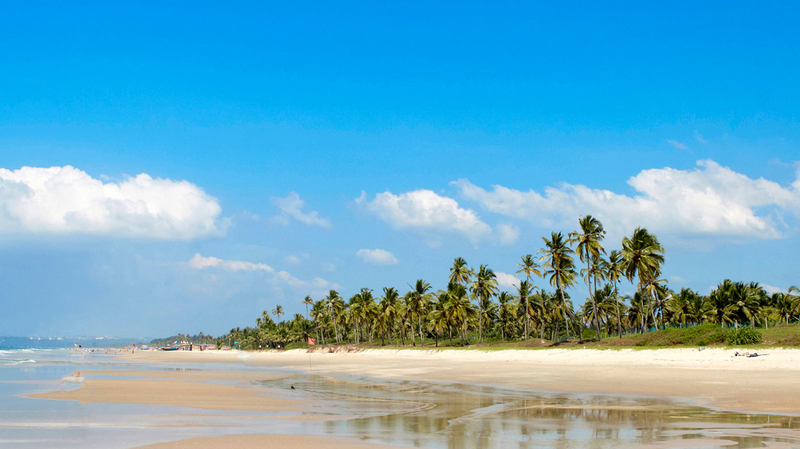 Goa's palm-tree strewn coastline is the ultimate beach haven. Luxury lovers and mid-range holidaymakers should look around the resorts of Cavelossim, Benaulim and Candolim. The Taj Exotica (Benaulim Beach) is the most elegant retreat in Goa, perfect for secluded and sumptuous stays. For something completely different, Bamboo House (Mobor Beach) in Cavelossim has peaceful cabins for mid-range hunters with an independent outlook. Budget-conscious travellers should check out Palolem and Arambol. Laughing Buddha (Palolem Beach) has rustic cottages right on the sand which will leave spare change in your pocket. There are plenty of shopping opportunities in Goa. Seek out jewellery, traditional textiles, pashminas, and clothing for some of the best buys. Ashoka Jewellers (Candolim) has some of the best quality jewellery in Goa while TukTuk (in the town of Margao) has a fine line in quirky local ceramics. Don't miss the weekly markets to hunt down cheap and cheerful crafts. Anjuna Market (Anjuna Beach) may be the most famous but Arpora Night Market (Arpora Beach) is much more fun. The night market happens every Saturday evening and boasts loads of foodie treats as well as live music to enjoy. The blending of Portuguese and Indian flavours in Goa created the infamous vindaloo curry, and spicy, hot dishes (especially with super-fresh seafood) are what Goa still does best. Chef Soumyen's Kitchen (Luis Marino Gomes Road, Calangute), is a top-notch place for a special dinner and has a menu of international flavours, if the Goan spice is too much to handle. A Reverie (Holiday Street, Calangute) is another good choice for sophisticated dining. For no-fuss, fantastic seafood served in a bamboo shack on the beach, Victor's (Beach Road, Candolim) is a definite must-do. Held to celebrate the end of winter, Shigmotsav is the Goan version of India's Holi Festival. Locals gather together for massive coloured water fights across the state. If you're here when it happens, prepare to get wet and don't wear anything you expect to be able to wear again. This three-day party is held before Goa's large Catholic community begin Lent. Panaji is the centre of all the action with a large and colourful float procession making its way through town. In Velha Goa (Old Goa), a massive procession of 30 saints takes over the roads on the fifth Monday of Lent. Very popular locally, it's a great opportunity to soak up some Goan culture. This one-night festival celebrates the Hindu goddess Lairaya, and her devotees at this festival prove their love by fire-walking across hot coals. It occurs at Sirigao Temple in Bicholim Taluka. Velha Goa (Old Goa) commemorates the patron saint of Goa with pilgrims both local and foreign attending massive processions in the days leading up to the actual feast on 3 December.